Haven’t decided on a hotel yet? You can look at other available hotels in Belgium with Booking.com. With its stunning cultural heritage on display at every turn, a visit to Belgium is an almost overwhelming lesson in the architecture of medieval town centers and turn-of-the-century Art Nouveau design. But most astonishing of all is Belgium is home to some 3,000 castles. That works out to one castle per every 10 square kilometers! Some 300 are open to the public, and a number of them you can even spend the night in. The castle hotel scene in Belgium still has a ways to go to match its counterparts in neighboring France or Germany, but here you’ll find a range from posh to homespun. If you can tear yourself away from your castle chamber, Belgium offers a range of landscape from an idyllic valley surrounded by forested hills hiding a tiny village on ahead to the modern city with countless interactive museums, art galleries, and market squares. And if you’re a history enthusiast, some of the most famous battlefields of Europe are within easy reach. What can I expect at a Belgian castle hotel? When is the best time to travel to Belgium? Is it possible to get married in a Belgian castle hotel? Bruges (Brugge) The ancient cobbled lanes, picturesque canals, towers, and churches of this stunning fairy-tale town paint a fine homage to its glorious past. A member of the Hanseatic League, Bruges became one of the wealthiest towns of the Middle Ages thanks to trade and textile manufacturing. Dynastic squabbles, rising taxation, and restrictions on guildsmen began the town’s long decline. Having escaped ruin from two world wars, Bruges today is a stroll through a world several hundred years old—well worthy of its UNESCO World Heritage status. The Markt is Bruges’s open market medieval square that’s encircled by step-gabled buildings. Climb the 366 steps to the top of 13th-century Belfort for views across the city. For a clever, interactive look into 15th-century Bruges, head to the northern side of the Markt and visit the Historium. Continue east to Bruges’s administrative center, the Burg, with more architectural delights including: the 12th-century Romanesque Basilica of the Holy Blood (Basiliek van het Heilig-Bloed); the Palace of the Liberty of Bruges (Landhuis van het Brugse Vrije) features the Renaissance Hall of the Liberty of Bruges (Renaissancezaal Brugse Vrije), a 16th-century council chamber with a beautiful carved oak mantle piece above a black marble fireplace. Next door, upstairs in the Town Hall (Stadhuis), you can marvel at the ornate Gothic Room (Gotische Zaal) filled with wall murals depicting Bruges’s history and a 15th-century vaulted oak ceiling with scenes from the New Testament. The Groeninge Museum is one of Belgium’s most highly regarded art museums. Here you’ll find works by Hieronymus Bosch (The Last Judgment), Jan van Eyck, and Magritte. The Lace Center (Kantcentrum) will educate you in the fine art of Belgian lace making. The Diamond Museum (Diamantmuseum Brugge) presents the history of diamond polishing. The Begijnhof (begijns were unmarried, religious women in the Middle Ages who did not wish to become nuns but needed a place to go) is a serene complex now occupied by Benedictine nuns who maintain the traditions of the begijns. Onze-Lieve-Vrouwekerk (Church of Our Lady) is home to Madonna and Child, the only statue by Michelangelo to leave Italy during his lifetime. Damme is a charming small town that served as Bruges’s harbor in medieval times. Here in 1468 is where the Duke of Burgundy, Charles the Bold, married Margaret, the daughter of England’s duke of York. A stern wheeler boat will take you here from Bruges during the spring and summer season. The Kasteel van Loppem is a 19th-century castle-like mansion that became the headquarters of the Belgian command and brief home of King Albert I during World War I.
Brussels Founded as a fortress town in the 10th century by a sixth-generation descendent of Charlemagne, Brussels in the 21st century hosts many of the political institutions of the European Union (the European Parliament, European Council, European Commission, and the European Council). Beyond the urban transformation this upsurge of power wreaked upon some neighborhoods, there’s an underlying hipness played out alongside the art-nouveau façades and medieval squares. Grand-Place Considered one of the most beautiful squares in Europe, you’ll find an ensemble of extraordinary architecture in all directions—worthy of its UNESCO World Heritage status. Gothic gargoyles and dozens of arched windows adorn its oldest building, the 15th-century Hotel de Ville (Town Hall), while ancient guildhalls and mansions are wonderfully photogenic. Shops and cafés abound. Musées Royaux des Beaux-Arts de Belgique (Belgian Royal Fine Arts Museums) hosts works from the 14th to the 20th centuries among its complex of buildings, including works by Hieronymus Bosch, Lucas Cranach, Pieter Bruegel, Rubens, Rembrandt, van Gogh, Matisse, Chagall, Miró, and Magritte. Musée des Instruments de Musique (Musical Instruments Museum) Tucked behind an art nouveau façade, any music lover will delight at the more than 2,000 historic instruments come to life by the accompanying audio guide. Musée Magritte You won’t find a larger collection of this surrealist painter anywhere in the world. Musée Horta If you’re intrigued about the development of Brussel’s art nouveau style, then be sure to visit the 19th-century home of its prime architect: Victor Horta. It’s a sublime showcase of the style that transitioned art from the 19th to the 20th century. Van Buuren Museum A museum since 1975 (and now a listed National Heritage site), the former private home of art collectors David and Alice van Buuren hosts a phenomenal number of paintings—well displayed in the house’s art nouveau interiors. Musée Royal de l’Armée et d’Histoire Militaire Considered one of the better military museums in Europe, you’ll find an impression collection of armor, weapons, and uniforms that cover nearly 1,000 years of history, in addition to World War I artillery, armored vehicles, and over 100 planes. Musée des Sciences Naturelles Tons of interactive exhibits and an amazing collection of dinosaurs will keep kids and their adults busy. Autoworld Over 250 vintage cars relate the history of the automobile. Centre Belge de la Bande-Dessinée (Belgian Comic Strip Center Museum) Housed inside a restored art nouveau department store designed by Victor Horta, here you’ll find exhibits dedicated to the history and art of the comic strip, including such heroes as Tintin and Asterix. Atomium Built for the 1958 World’s Fair in Brussels, nine metallic balls linked with tubes that contain escalators represent an atomic structure of an iron crystal enlarged some 165 billion times. It has now become one of Brussels most recognizable monuments. Right next to the Atomium is Mini Europe, which features iconic monuments of the European Union’s member states—such as Big Ben, the Leaning Tower of Pisa, the canals of Venice, Berlin’s Brandenburg Gate—all at a scale of 1:25. Cathédrale des Sts-Michel-et-Gudule This Gothic cathedral, which bears a resemblance to Paris’s Notre Dame, was begun in 1226 and finished some 300 years later. The stained-glass windows were a gift from Habsburg Emperor Charles V.
Église Notre-Dame du Sablon This fantastic Gothic church was once the early 14th-century chapel for the archers guild. The acquisition of a statue of the Madonna turned the church into a site of pilgrimage attracting those who came to experience the statue’s healing powers. Ghent (Gent) Former seat of the Counts of Flanders, Ghent was one of Europe’s most important cities of the Middle Ages. Its fortunes came from cloth and its demise came from Holy Roman Emperor Charles V who rescinded the town’s privileges and demolished its walls in 1540 after its citizens revolted against high taxes. Gravensteen Castle Built by one of the counts of Flanders, Philip of Alsace, upon his return from the Crusades in 1180, this fabulous castle has 2-meter thick walls, a moat, turrets, arrowslit windows, battlements, and a torture museum. Sint-Baafskathedraal (St. Bavo’s Cathedral) is home to Jan van Eyck’s masterpiece The Adoration of the Mystic Lamb, a 24-panel altarpiece completed in 1432. In addition, you’ll find a work by Ruben: The Conversion of St. Bavo. One of Ghent’s most charming neighborhoods to stroll about is Patershol, where cobbled streets lead to cafés, shops, and centuries-old buildings, now protected monuments. Antwerp (Antwerpen) 16th-century Antwerp was one of Europe’s major trading, financial, and cultural centers, but its fortunes declined with rioting Protestants, mutinous Catholics, punitive treaties, and German occupation and bombing during World War II. Today, Antwerp can boast about being the second largest city in Belgium and one of Europe’s largest ports. Interestingly, 80% of the world’s uncut diamonds are traded here every year. Het Steen The oldest structure in Antwerp, this picturesque 13th-century fortress not only controlled access to the river, but served as a prison for over 500 years. Onze-Lieve-Vrouwekathedraal (Cathedral of Our Lady) Belgium’s finest Gothic cathedral was built between 1352 and 1520. It features an unusually high (123 m) spire and four masterpieces by Rubens. Museum Plantin-Moretus is a Renaissance and Baroque era printing house now listed as a UNESCO World Heritage Site. Inside you’ll find a preserved 17th-century library, historic bookstore, collection of manuscripts, and art treasures including a Rubens. Rubenshuis (Rubens House) Home and studio to artist Pieter Paul Rubens, visitors will enjoy ten of his canvases. MAS (Museum aan de Stroom) This modern museum tells the story of Antwerp and its people. Great views from the top! KMSKA (Koninklijk Museum voor Schone Kunsten Antwerpen or Antwerp Royal Museum of Fine Arts). Closed for renovation until the end of 2017, its world-class collection of paintings by Flemish Masters—Rubens, Magritte, Ensor, van Eyck, Rembrandt—can be seen for the time being at regional exhibitions. Ardennes When you’re ready for some outdoor activities in a relatively unpopulated region, the Ardennes offers just about whatever you’re looking for: hiking, bicycling, horseback riding, swimming, skiing, canoeing, fishing, and even spelunking. Or you can simply pass the time enjoying the forested hillsides and gentle rivers, enormous stone castles and tiny villages. 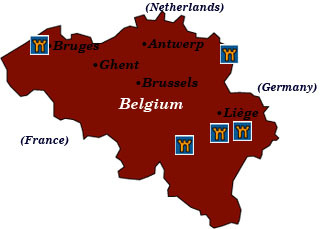 Battlefields For centuries, the fields of Belgium have witnessed some of the more famous battles of Europe. The 1815 defeat of Napoleon changed the course of European history. If you come during mid-June, you can witness a re-enactment on the Waterloo Battlefield. Some of the more fierce fighting of World War I took place in Flanders’ Ypres Salient, and battlefields, cemeteries, and museums are spread out over a vast area. If you pick one museum to visit, the best one is the award-winning In Flanders Fields Museum. The town of Bastogne in the Ardennes was pivotal during World War II’s Battle of the Bulge. For an introduction, visit the Bastogne War Museum. During World Wars I and II, occupying German forces built a extensive network of bunkers along the Atlantic seawall in Ostend. The Atlantikwall is an open-air museum with a 2-km walk past trenches and some sixty bunkers that are among the best preserved in Europe.